Two hundred years later, the issues raised by Kant remain with us. We are familiar with the dilemmas of unthinking acceptance of authority. Debates rage over individual rights of women to aspire to religious roles, gay couples to marry with the approval of the state or religious leaders, and the rights to free speech. He argued that in an Age of Enlightenment, there a possibility for human progress from nonage through the application of reason. 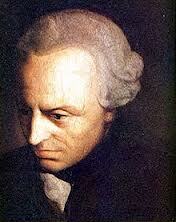 Kant was no utopian believer in the emancipation of the human race from its largely unreasoning condition. He drew attention to several difficulties. Specifically he examines the roles of ‘Guardians’ who have a designated public role in which they sustain the institutions of state, including the established social order, [the monarch, or tyrant] the military, and the government officials. Kant illustrates how such public roles come with public duties: A military officer obeys orders, a cleric accepts doctrine, a tax collector has no right to challenge the principles behind the demand to the citizens to pay taxes. The public official thus has restrictions imposed on the application of reason to challenge publicly the offices of state. However, he sees how without reason and challenge, the institutions will ossify. He argues for the right of such individuals in public office to exercise reason privately to explore how the systems may adjust to changes over time. Kant concludes that the state is advised to permit the exercise of private freedom to test and challenge the institutions and their functioning. An enlightened ruler permits freedom of articulating religious, as well as artistic ideas, as falling into the processes for sustaining the viability of the State. The age of enlightenment gave intellectual impetus to radical and revolutionary disruptions of the old order [the ancient regime in France; the British rule in America]. However, Kant notes that any revolution will not sweep away restrictions to personal freedom, although they may replace a more repressive regime with one more prepared to grants to individuals to think what they like, as a Fundamental human right. He points out that such freedoms have mostly been feared by unenlightened rulers who have not seen that repressing such freedoms will eventually be counter-productive. I find the ideas expressed by Kant more than relevant as I listen to the contemporary discussions raging over individual freedoms, the appointment of women priests and bishops, and the legitimacy of marriage granted by religious and political institutions. This entry was posted on Sunday, February 17th, 2013 at 1:38 pm and is filed under Uncategorized. You can follow any responses to this entry through the RSS 2.0 feed. You can leave a response, or trackback from your own site.